There’s an article in the April Anne Summers Report that points out that this honorable magazine has continued the mysterious process of selection of musicians for their lists that keeps those pesky women in their place. As Diana Wolfe points out, the magazine continues this practice using its own unknown selection processes. 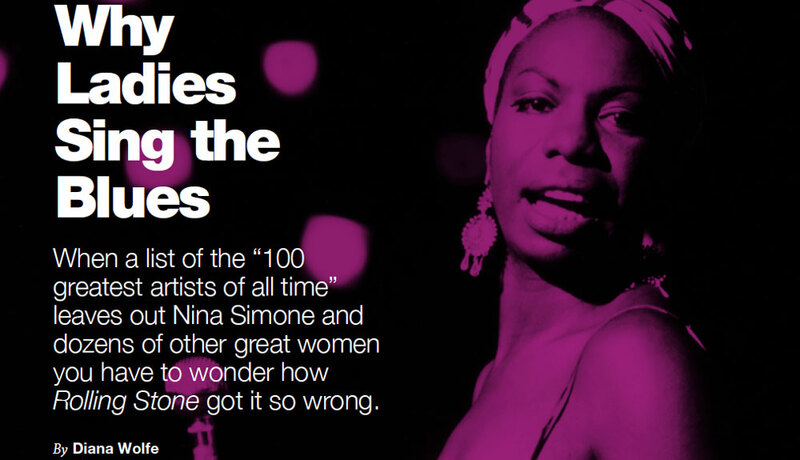 And to everyone’s surprise, in their most recently in 2013, eight of the 100 chosen musical artists are women. And to make things worse, one made it into their top thirty. So while the magazine has championed so many political, social, environment and social issues through first class journalism, the editors have continued to neglect the obvious. Women musicians have now an equal profile within our culture. It is indeed sad to see that the Rolling Stone Magazine has yet to mature. For this article from the April 2014 Anne Summers Report – click here . For the full report go to the Anne Summers website – click here and support her work through the her reports. PS: Watch this space for a few reviews on some musicians I have been listening to in the last weeks.